Oh la la… I am loving the tissue paper flowers. I have been seeing them all over the internet on other crafter’s blogs and I finally tried them. They are so easy and so cute. All I did was take a long strip of tissue paper, fold it up several times and punched it with my Scallop Circle Punch. I was a little scared at first, Stampin Up does not recommend using your punches to punch several pieces of anything, but I knew the risks of doing it and was more than willing to replace my punch if I killed it. I closed my eyes, held my breath and squeezed, when it was over I had several tissue paper scallops and a punch that still worked! Yay! Then all I did was put an Antique Brad in the center and ruffle the whole flower til I was happy with the way it looked. Love it! I don’t have to worry about it getting smashed in the mail, because the recipient just has to fluff it back up when they receive it! I don’t know if you can tell by all my exclamation points, but I am really excited about these little tissue paper flowers. The layout and the colors were inspired by the Special Issue of Stamp It! Techniques by Papercrafts. 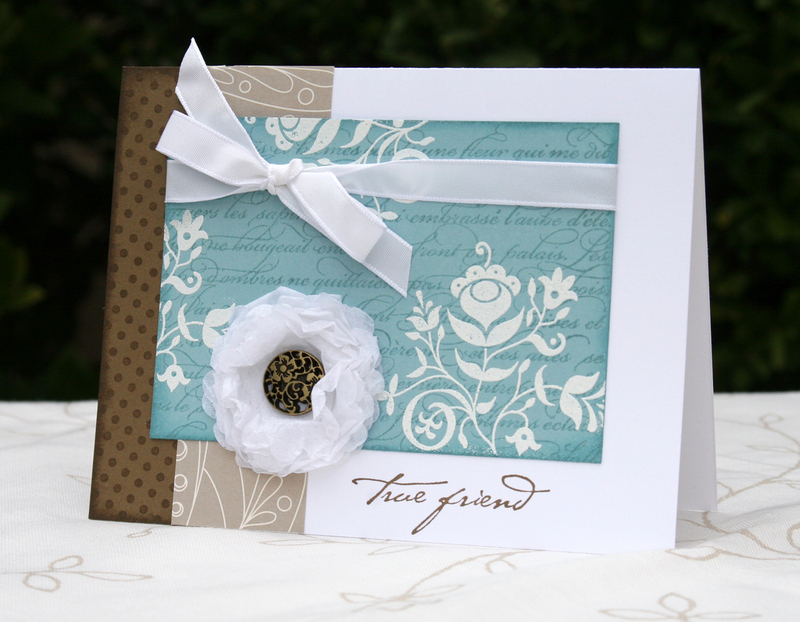 I changed it up to feature Stampin’ Up images and product and I’m happy with the outcome. Hope you like it too! This is so pretty, and yet so simple to make. Guess I’ll be pulling out my tissue paper today and putting my vintage brads to use. TFS! To speed up the process, perhaps the flower edges could be colored with the dauber….just thinkin’…..